6/10 seems about right, could not fault the beer, it was really in very good order (Sambrooks and I'm not usually a fan of that). It did feel very cliquey and full of a hipster in crowd/more an eating place though. 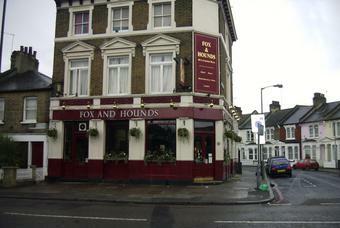 Having been to Powder Keg Diplomacy earlier in the day, I returned to Battersea to try the Fox & Hounds. This has the appearance of a spit and sawdust local. But make no mistake, this is now very much one of those new breed of pubs with a bohemian feel and appealing to well-heeled 20/30-somethings. If you're not in their clique, you don't feel that welcome. Nevertheless, 4 ales were on - Dark Star Hophead & American Pale Ale, Sambrooks Junction & St Austell Tribute. Has a certain appeal. But I preferred the Powder Keg. Fairly typical SW London dining pub, virtually identical to dozens of other Victorian corner pubs around here. Beer range was short and sensible, and the Wandle Porter was good enough, but not a place I wanted to linger, in contrast to Powder Keg Diplomacy down the road. I don't know when this pub was updated but all of the reviews for it seem to be from years ago. A sea-change must have taken place. This is now one of the best food pubs I have ever visited. The ambience is great - not too foody with enough 'pub' about it to keep it in GPG not GFG. The beers are excellent including a number of Hophead stalwarts - now my favourite local brewer. The food is fabulous, essentially Mediterranean and hugely authentic. The staff are top notch, friendly and animated. The prices are not silly. And all within a stonesthrow of Clapham Junction. I am sure we will be back! Great mid week cosy pub in the winter. Serve great food which they change regularly and is not too expensive. Nice garden to sit out in the summer and the staff are nice and friendly too - nuff said!